‘What you’re going to have for lunch, and what you look like, are the two most important things you think of when you get up,’ says Italian chef Giorgio Locatelli, on being asked what being Italian means. It’s hard to overestimate how important food is to Italians. It goes way beyond just simple nourishment. Discussions about how a particular dish should be cooked, or what sauce is acceptable with which pasta shape, or which wine suits your Acqua Pazza, are serious business. Chef Locatelli says when he was growing up his parents genuinely mistrusted a family who lived nearby because they put parsley in their minestrone. His parents saw it as an unforgivable sin. Chef Locatelli has argued that there is no consensus in this argument on what’s the correct way to prepare a dish. But put it this way; imagine if you have refused to talk to your neighbours because you found out that they used mustard instead of tomato sauce for their chips. That does sound a bit far-fetched though. While it may be fine for most people, the Italians are deeply proud of their relationship with their cuisine. They would not take it lightly if anyone or anything comes between them. 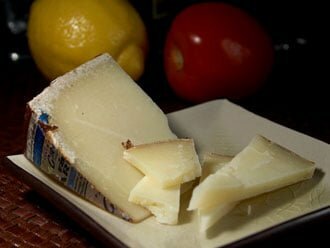 I have a friend who once cooked for Italians in Tuscany and the Italian husband came food shopping with her to make sure she chose the correct Pecorino cheese – the particular speciality of that village. There were several in the nearby alimentary and he wasn’t prepared to risk her buying the wrong cheese. The British notion of not imposing didn’t occur to him. There is too much pride at stake. The reason for this reverence for food and how it’s prepared stems from the importance of family in largely Catholic Italy. Large extended family groups come together to eat as often as possible. The average year is littered with saint’s days and festivals, around which traditions have grown about particular foods that must be eaten. So if you have large extended families gathering together during the festive or religious occasions, traditions becomes a big part of it. And that tends to revolve around food. For example, 19th March is St. Joseph’s Day, and when cafes and bakeries start to fill their show windows with the sweet cream filled puffs, you know Saint Joseph’s Day is here. Zeppoles, also known as Italian doughnuts, are light golden pastries filled with yellow cream and dusted with powdered sugar. 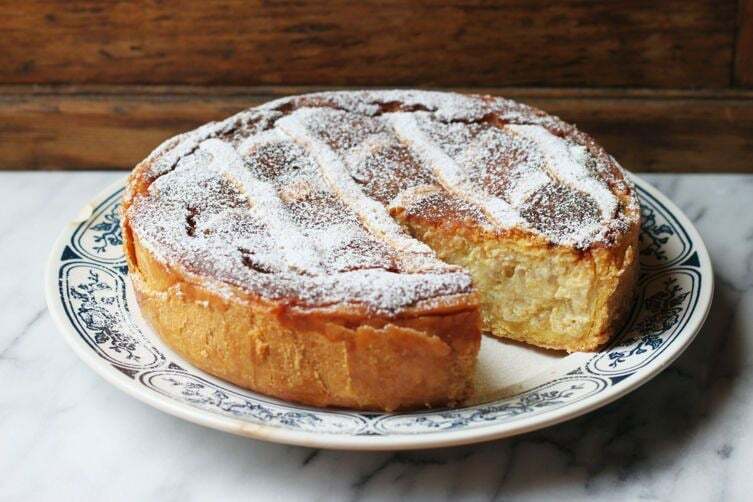 Another example is the Pastiera; a sweet creamy deep dish pie-like dessert, originally from Naples but popular all over the country. This dish was created by a Nun in a convent who wanted to make a dessert to celebrate the coming of Easter. So she created this cake as a symbol of Resurrection. The family set up is also very traditional – “nonna” or mamma will be doing all the cooking – and celebration meals will last several hours. What is eaten becomes so ingrained in the family and the region’s folklore, that to change anything is unthinkable. Italian families also have a tradition of dining together on Sundays, similar to us Brits. 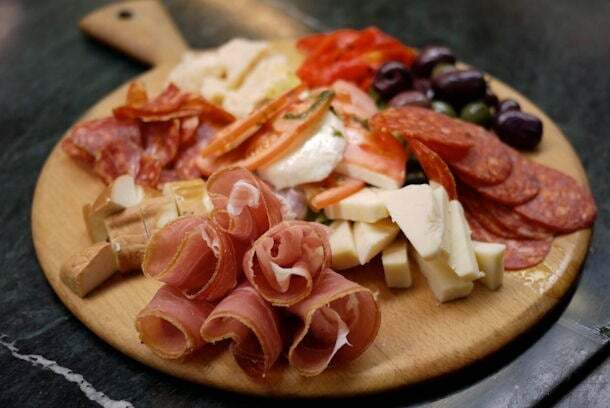 They will be likely to start with antipasto, directly translated as “before the meal”. They vary in regions but they traditionally consist of cured meat, olives, mushrooms, anchovies, various cheeses, pickled meat and vegetable in oil or vinegar. This is followed by two main courses: “primo”, which might be home-made pasta or a soup such as minestrone, and “secondo”, a meat or fish dish. This is then followed by cheese, local of course, and then dessert, before ending the meal with espresso and ammazza-caffe (meaning coffee killer), i.e. a limoncello or other liquor. This is what it is all about for the Italians; enjoying local traditional food and enjoying it with family. And you can bet that each dish will have been tried and tested countless times. They won’t suddenly cook a new dish for this family meal. Giorgio Locatelli says that there are five words which define Italians: passion, pride, egotism, happiness and style. Focusing on the passion and pride Italian’s are known for, this certainly spills into the food culture. Italian regional food traditions and specialities are guarded with fierce pride. Just as the Italians have successfully preserved so much of the beauty of their Renaissance art and architecture, they’ve also kept hold of food traditions, too, and guard them well. UNESCO has even recognised the fabled Mediterranean Diet including fresh tomatoes, olive oil and garlic on a list of Intangible Cultural Heritage of Humanity. We know that Italian food has now travelled all over the world. Emigrated Italians have always brought their cuisine with them and used food as a comforting taste of home, setting up restaurants and sharing their passion with the rest of the world. But we foreigners are not such sticklers for upholding regional ideals. In fact our alteration of some Italian dishes and traditions puzzle Italians. They wonder why we drink a cappuccino walking down the street instead of sitting in a café for our morning coffee hit and a latte in the afternoon? Are we crazy? How could we imagine that sprinkling cheese on seafood pasta is acceptable? And meatballs with pasta? No grazie. Italian food, crucially, has simplicity at its heart – fresh ingredients from the ground, grown under that wonderful Mediterranean sunshine, cooked simply and with love and care. The care taken in preparing it is part of the culture – the slow food movement started in Italy as a backlash against the creeping anathema of fast food. Its aim was to preserve and promote traditional culinary values, such as making food with love and attention to detail and with awareness that those who eat it will appreciate it. Whether it is art, politics or sport, in Italy the most important thing is to have passion for what you are doing (as you can see in the video below…such passion!). It’s this passion and pride that also make the food so delicious, popular and wholesome. In the UK, some farmers markets and food shops offer produce that’s more about “show” than genuinely exceptional food. But in Italy, food has no class. At the 2016 food and farming judging for radio 4, Yotam Ottolenghi said, on inspecting dozens of cured meat from producers in the UK, “I was looking for something that smells like Italy”. That tells you everything about the impact Italian food has in today’s cuisine and how much it deserve its place as amongst the best cuisine in the world. There’s an authenticity about Italian food that can be hard to find elsewhere; Italians know that and preserve its place in their lives and at the centre of their culture with deep pride. And unsurprisingly, we like our customers to get the best Italian food experience possible in Italy. There’s nothing like making fresh pasta and using fresh produce to create the most delicious and authentic Italian food possible. Flavours Holidays organise trips to Italy to learn cooking, alongside sampling the amazing Italian cuisine in an authentic environment. Click here to see availability.